In the November edition of our Preemie Family newsletter we learned about 24-week preemie twins Alexandra and Veronika Kostova was born at 730 grams and 680 grams and spent 5 months in the NICU before dying and 2 days in the NICU before dying, respectively. Later, Mom Nina went on to have another set of twins, at 29 weeks, Martin at 1170 grams and Joana at 930 grams who stayed in the NICU for 3 months each. 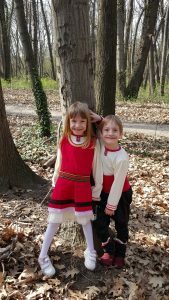 Read more in an update by their mother Nina Nikolova. In 2008 I got pregnant with twins, the best news I had ever heard, two girls. We were so happy at that time. I remembered the first exam, when we saw the babies, and even got a CD. I was watching them every day, so tiny, beautiful, healthy girls. Then the whole world changed in five minutes. We have been to our doctor when he saw there is not enough amniotic fluid in one of the sacs. The doctor told me we have to be very careful and observing the baby in a few day. I was in 21stg.e. For first time in my life I was so scared. I entered into a hospital in my 23rd week of pregnancy. The amniotic fluid decrease constantly. In the afternoon of 8th of September my water broke and I went into labor. Almost 22 hours of pain and big fear. I remembered my husband going around, even slept next to me on the floor. He was so scared and was going close to the hospital to cry, for me, and for our little babies. I gave birth at 9 AM, my two little girls, 670 grams and 730 grams. It was a natural birth, I remember every push. Then I felt asleep. After few hours I woke up and wanted to go home. I was feeling so happy and the only thing I wanted to do is to take a long shower and continue my life. None of those happened. The doctor cane to my room and invite me to the NICU, a world totally new for me. The first time I entered the NICU and saw my babies I wanted to stay there forever. Two little girls, so tiny, so small with two hats. I fell in love. The next day the doctor call and ask us to go and to discuss the situation of the smaller baby. She was in a very bad condition and after a while passed away. We never got to give her a name. 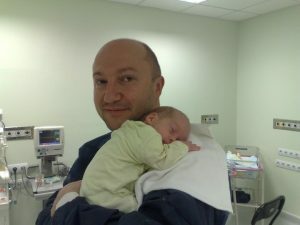 According to the Bulgarian law at that time, we were not allowed to name our child if the baby is born under 1000 grams and below 26 weeks of pregnancy. They treated her as a biological garbage and took her away. The second baby was still alive. After a week we gave her the name Alexandra. She was so nice, so sweet and then she started growing. Day by day. Of course after birth, the doctor gave me some pills to stop my breast milk from coming in, just in case the baby dies. Alexandra lived for 5 months and 11 days. She developed Bronchopulmonary Dysplasia (BPD). We did our best to treat her even try Israeli hospital but she didn’t have the chance. So, I was devastated. When we got home and I started crying, every minute, every second. Why, why, me, why my babies? After few days I said to myself – enough, you have to continue your life . . . In 2010 I got pregnant again, again twins, again millions of difficulties, problems, bleeding, hospital stay for a month. And again I delivered my babies prematurely, at 29 weeks gestation. They stay in the hospital for 3 months. I still remember the day the doctor called me from the hospital and asked me to go to meet with her. I was so scared, I was expected really bad news. But instead we were informed that we could take the babies home. 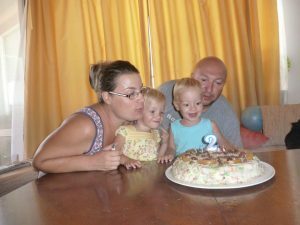 So, today I am a happy mother of a healthy boy and girl, already 5 and a half years old. It was during the spring I was walking in the park with my twins, it was cold, but I felt so happy that nothing can change my mood. Recently I have received a phone call from a very close friend of mine. She is the chair of the Bulgarian Foundation “I Want a Baby.” And she was so happy on the phone telling me: Nina, I have found a sponsor for your foundation. I was so surprised! What foundation? I do not have any foundation. You already have funding for your new foundation for premature babies. I was so shocked that I call two mothers of premature babies and asked them if they want to join me as part of the foundation. They were so excited, so we had a press conference and started. That was in May, 2012. As we like to say, three happy moms of five premature babies. In four year we are still the only foundation in Bulgaria, one of the most popular and well known. We have built a strong structure and trust in the people. It was very difficult in the beginning. The population was not familiar with the problem, the others denied to share their stories, and the doctors were angry and didn’t want to accept us. Than at that time I have found EFCNI and we become partners. It was a very huge and important step for us. Than I was invited to share my story and the problems we face in the EU together with EFCNI. I was so scared and didn’t know what to do. I remembered I even forget to change the slides, but the impression I left, got a huge response. Then we continue with World Prematurity Day, some big campaigns, charity bazaars and some more activities. Last year for World Prematurity Day we published the first handbook and its electronic version for premature babies – http://earlybaby.info/ We are so proud, have distributed the notebook for free in 27 NICU’s all-around Bulgaria and now the electronic version can reach everybody and can help. Something we face as a big problem year ago, where there were no information on the internet. After my first meeting with EFCNI I participate on my first parent’s organization meeting in Munich, the place I have met Mandy Daly for the first time. I was so impressed what other organization, foundation are doing, so I left the three days meeting inspired and the only thing I wanted to do at that time, was to change the world, the world of the smallest heroes, our premature children. Few year after my first meeting with other parent’s organization, I have heard about NIDCAP program. I was so impressed that I want it so badly in Bulgaria and didn’t know what to do. Step by step, Mandy have told me about the NIDCAP and about the NFI. And here I am now. Looking for an answer how to improve the situation in Bulgaria, how to invite trainers and to teach the nurses about the NIDCAP and the need of our premature babies.